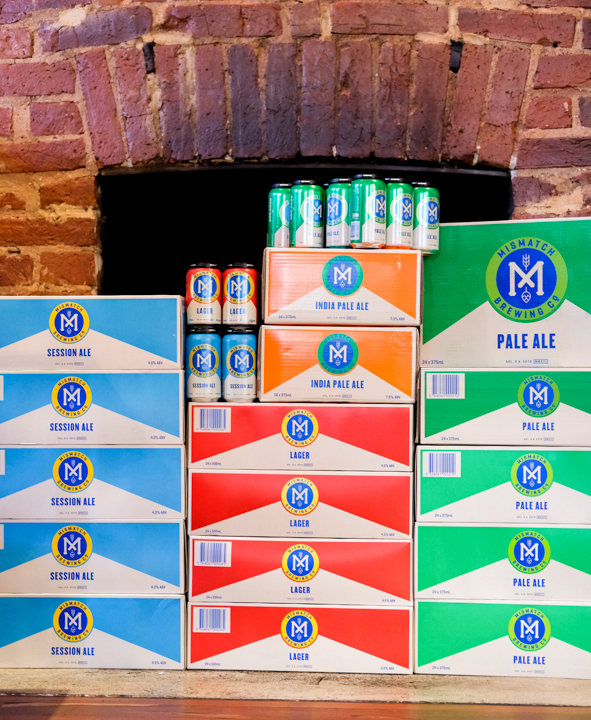 The IPA is the latest beer to make it into Mismatch's core range, and has been in the works since the company began in 2013. The introduction of Mismatch’s first IPA to its core range was a nervous moment for brewer, Ewan Brewerton. The beer has been in the works since the earliest days of the company, when it was operating out of Big Shed’s facility in 2013. Several iterations have made it to market in keg form, but it’s only now, five years later, that the beer has had an official release. Mismatch IPA is available now in independent bottle shops. “It’s one of those things where you’re certainly judged on them,” Ewan says. “A little bit less bitterness – not too much, you want to know that you’re drinking an IPA – and then [we’ve] used a fairly unknown hop in Australia so far, which is called Idaho 7, as the hero in the beer, which [gives]… a big, punchy, tropical aroma, kind of like a stone fruit hint. The five-year gestation period is not uncommon in Mismatch releases; the company’s Pale Ale, released earlier this year, came through years of refining their XPA, before deciding the market was too crowded to introduce a beer in that style. “We’ve been kicking that one around since 2014, experimenting with different styles of pale ales and everything else,” Ewan says. “The XPA was a good beer, but it was one of those beers where the style was very confusing… Other breweries [were] doing their version of XPAs as well – so you’ve got some high ABV, some really low ABV, some light in colour, some heavier, it really just confused the market, and ours was going to get lost. The Kings Head’s collection of the Mismatch family. Mismatch has also recently announced two summer release beers – the Strawberry Berliner Weisse, available now on taps throughout Adelaide; and the Mandarin Berliner Weisse, a which will get a can and keg release in mid-December. Both summer beers are the consequence of the relationship facilitated by Lot 100, the $4.5 million facility that houses Mismatch, Adelaide Hills Distillery, Adelaide Hills Cider, Vinteloper, and Ashton Valley Fresh, the latter of which supplied Mismatch with strawberries and mandarin juice. In-house collaborations are likely to happen more often as each of the partnering companies settles into their new collective home, and are also facilitated by the brewery’s size. “There’s a lot of tank dedicated just to small, experimental fun stuff that, once we get on top of all our volumes and everything else, we can start having heaps more fun,” Ewan says. Keep an eye on the taps and fridges at your local for upcoming Mismatch releases.